Fiery Confluence deals 1 damage to each creature. Fiery Confluence deals 2 damage to each opponent. @mmcgeach My best win so far was a fast paced game where a guy was killing everyone with draw damage which was helping me find answers, but really hurt. I helped him kill everyone including me with wheel effects and my commander, but I got Sire Of Insanity out early so everyone was top decking answers. Everyone was dead and it was just him and I. He was at 6 and I was at 6. On my turn I had to draw and take 2 damage per draw and he had me drawing an extra card on upkeep. I top decked a Demonic Tutor and slowly went through my deck to find and answer. I found Fiery Confluence and killed em with it, but without that top deck it was over. I'll say it again this deck can grind with the best of em and puts out interesting "stax" to slow the game down. I love it. Recently built Riku myself. Ended up with two versions: Riku Token Tricks and Riku Midrange Toolbox. Guided Passage is made for Riku. 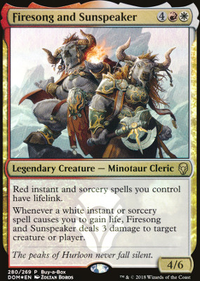 Fiery Confluence , Verdant Confluence and Mystic Confluence , Incendiary Command , Primal Command , Cryptic Command and Atarka's Command seem like auto includes for Riku. Too much value. I've not been sure about this one for a while. Enchantment destruction only exists in Green and a bit of White (sans Artifacts), so that's not a big concern. How fast can this card usually go? I know it can turn into an easy source of mana, but I'm mostly concerned about pulling it out in the mid-late game- a burn deck's late and extra late game, if you will. I would love to run one, but Idk about it. This one has been suggested by multiple people. Is it that good in Commander? 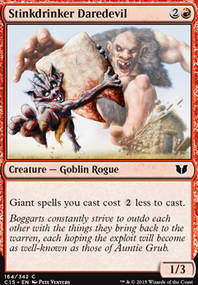 I'll admit, the 5-CMC on a ramp card feels a bit much combined with relying on what my opponents have done. I do think the deck could use similar ramp - Desperate Ritual , Seething Song , etc. - but Idk about Geyser. I've had mixed feelings here before, too. For 4-CMC it can be picked off somewhat easily, being a 2/2. I'm less hesitant with Mizzix than I am Geyser, that's for sure. I like the effect a lot. I've been playing this in my irl physical build because I don't have Star of Extinction . It occurred to me last night that both would be good. I like it so far. It's great for punishing heavy token players. Blue has too many good things that I keep forgetting stuff like this. This card is honestly tempting. I think the only reason it hasn't been in previous versions has to do with being afraid to run too many X-drops in the deck. X= 0 in select cases, rendering them useless for effects from a creature like Combustible Gearhulk . I might at least try it. There's Blue Sun's Zenith to consider, too. I haven't experimented with this card much, and it's probably about time I did. I hadn't thought of it as a tutor before. · Smash to Smithereens is more of a tech. There's plenty of Artifact removal, but burning for 3 to face and destroying an Artifact on a 2-drop is great. Probably swapping out with Disk. · Fiery Confluence I'd say is still pretty great. True, it's a 4-drop, but it still burns everyone for 6 to face. Confluence also doubles as, what I now like to call, a Repercussion outlet that doesn't damage me like the other outlets do. Probably going to keep around. · Mystic Speculation is outclassed by Vault. 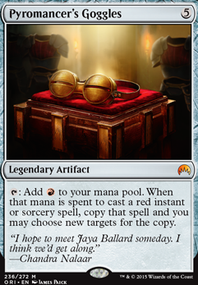 I can Buyback Speculation, or I can pay some extra life to spend less mana in the long run and do the searching right the first time. Definitely swapping out for Vault. · Etali, Primal Storm gives mixed feelings. If it were sending things to the GY and not exiling things, they'd be less mixed. The biggest purpose it has is triggering the likes of Guttersnipe , Thousand-Year Storm , Aetherflux Reservoir , and so on. Etali also lacks Haste, First Strike, or anything else of the like while boasting a 6 CMC. Hmm... I might need to test without it a little. Not sure. · Arterial Flow was recommended as a way of gaining CA via giving out CDA to opponents. Not exactly relevant if I have more draw power and speed. Arterial Flow is difficult to cast because of its BB cost that I only tolerate in Torment of Hailfire . Definitely replacing Arterial Flow. ·I left Reanimate in the deck because I have few creatures as it is. Being able to get some back once or twice is handy. Unsure of what to do. · Risk Factor doesn't have the heft I hoped it would. The difference between it and Gearhulk is that either way I gain an advantage with the latter (sending things to the grave and then casting them). 4 damage might be 1/10th of 40, but opponents don't care a lot. Probably replacing Risk Factor. Ravnica Allegiance was great for clan Rakdos! Time to make some changes.. Flexibility is king in Commander. Blow up anything that Rakdos can blow up! 2 cards for one mana? Yes please! Also, Torgaar is a bit of an awkward card. 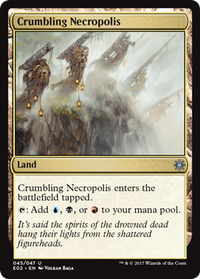 Typically, we've done a huge amount of damage by the time we cast this (presumably with discount from Rakdos's ability). So it turns out to be "win more" most of the time. Damage to summon the king. Vial Smasher was also awkward because we typically don't want to cast spells before getting our mana discount. And by himself, he probably won't help us get any damage. Damage to summon the king. 4 mana spent to get an 18 (EIGHTEEN) mana discount! Damage to summon the king. The Spawn alone can get us a 7 mana discount! Alright can definitely give you some ideas than Salinas29! Neheb, the Eternal - Highly recommend this card! 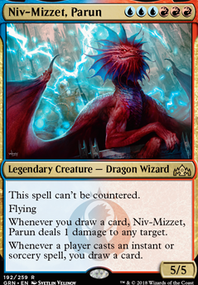 Etali, Primal Storm - In multiplayer pods this card is devastating! Vial Smasher the Fierce - Great card all around. Viashino Heretic - This is if you play in a artifact heavy meta. Twilight Prophet - Card draw and damage, love this card a lot. Lobber Crew - Decent effect if you have a lot of multicolored spells. Pyrohemia - Semi board wipe effect but also cost reducer for you. Pestilence - Black version of above one. Sunbird's Invocation - Extremely fun card to play with. Sarkhan's Unsealing - Can get really nasty real quick, plus low cost. 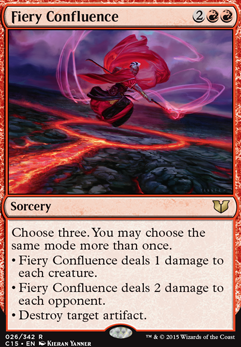 Fiery Confluence - All modes are relevant in this deck. Angrath, the Flame-Chained - Control and reducer, a bit high on CMC though. Chandra, Torch of Defiance - An all star, ramp, reducer, and card draw. Conduit of Ruin - Allows you to grab creatures and additional cost reducer. Void Winnower - Hate piece and a big filthy creature. Steel Hellkite - Beater that can destroy a lot of good stuff. Combustible Gearhulk - Card Advantage (CA) or cost reducer, win/win. Sandstone Oracle - Hand refill on a stick. Garna, the Bloodflame - Semi recursion in case of a boardwipe. Importantly as well is to have some early game plan, ramp, CA, and utility spells. Here are some cards that can be also considered. Aside from that feel free to ask for any additional help, I love helping people tune their decks! Updated with Fiery Confluence kill in the Bonus Round scenario. Bonus Round + Fiery Confluence is a lot of damage.